The first time I fell in love with the food at New Formosa, has got to be the first time I ate their Three Cup Chicken. 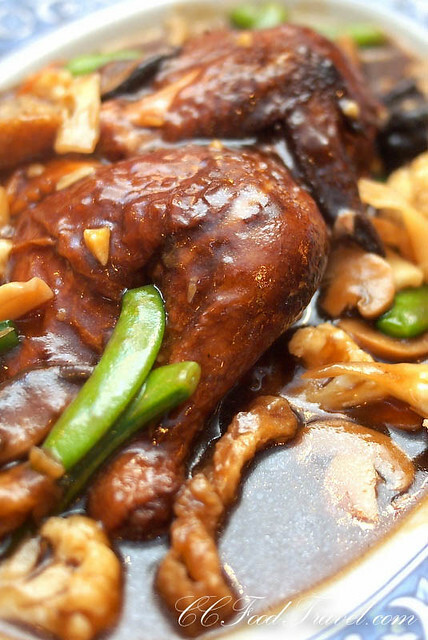 You see, three cup chicken is a classic Taiwanese dish, one which I only learned to appreciate, when I visited New Formosa a couple of years back and tried it for the first time. I also learned to love Taiwanese food for being unpretentious, humble, and homey, yet super tasty and delicious. And if you’re wondering why the name three cup, it comes from the three key ingredients: sesame oil, chinese rice wine, and soy sauce. Cups are the equal ratio or the measurements of the three ingredients. 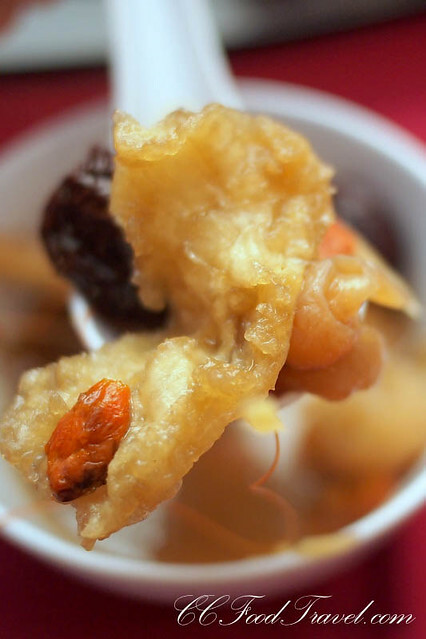 Wow, you have got to take your hat off to the Taiwanese for being so interesting, gifted really, when it comes to cooking. A true and authentic Taiwanese three cup chicken calls for basil leaves, the soul of the dish that heightens the taste and aromas in the dish! And so this year, the Year of the Wood Horse, I find myself, back at New Formosa, irresistibly drawn to their amazing cuisine. 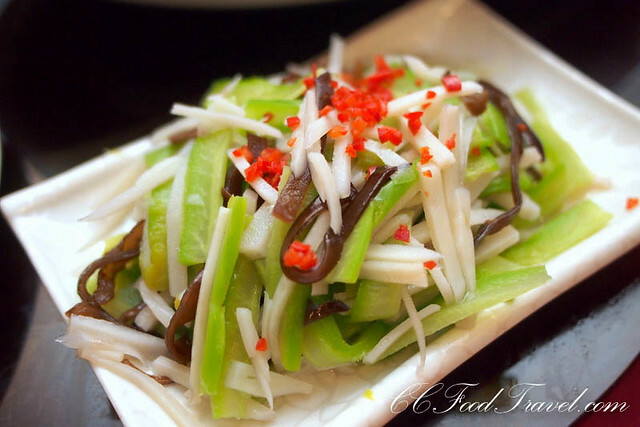 The latest items on offer at New Formosa, will definitely impress even the most jaded tastebuds. 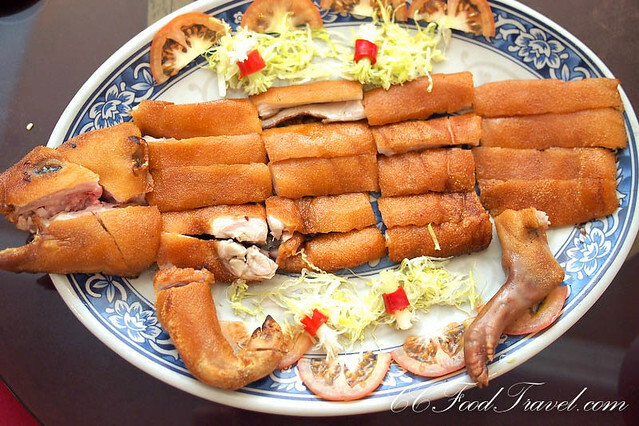 We settle down to dinner and the first dish to be presented was half a crispy suckling pig, done in Hong Kong style. It had more of a matt, mustard-colored crispy skin, rather than a shiny mahogany skin. It was still every inch as tasty and the skin really crackled as you bit into it. I loved the fact that it possessed a soft and succulent flesh, with very little fat on it. The best part was the cheek near the head, and I wished there was more of it! 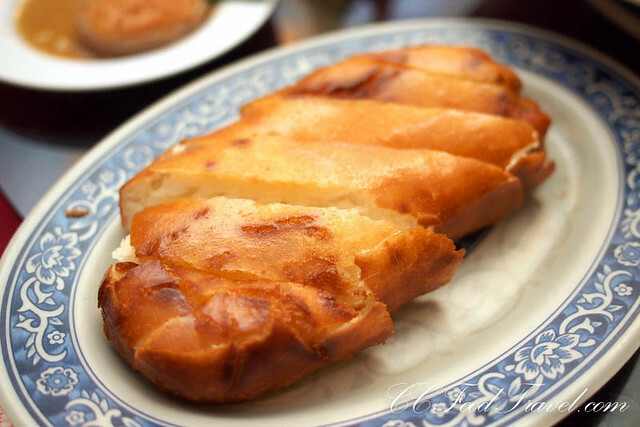 The next dish was meant to be eaten with some sinfully addictive, deep-fried mantou. A succulent half a braised chicken with seafood and vegetables was served almost drowning in a thick sauce of its own juices, mushrooms, clams and squid and peas. Flavored with star anise It had obviously been braised for ages, and soaking up the sauce with the mantou, it was just too good for words. Then came the waiter, bearing a long bamboo which I thought looked rather interesting. 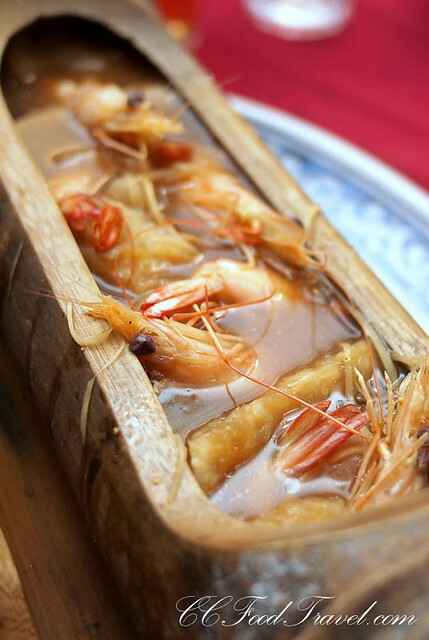 Inside were prawns, cooked in a herbal wine which was rich in flavors of goji berries, red dates and ginger. It was immensely warm as you drank it.. I guess it had tons of healing properties and could probably ward off any cold if you were feeling under the weather. 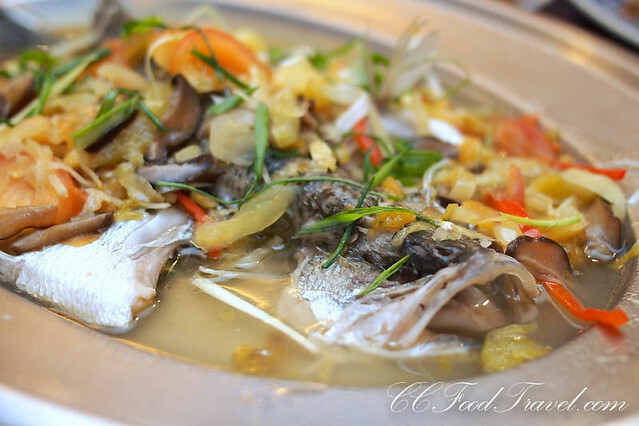 I particularly loved the fish maw in the soup. I drank up every last drop in my bowl and went back for seconds. The next dish was a classic, that I’ve come to love, dining at New Formosa. 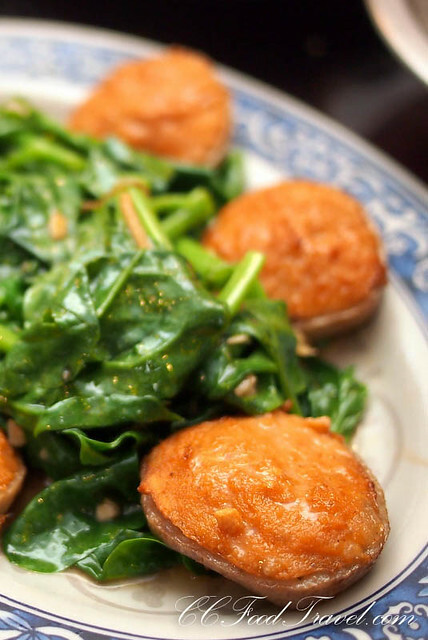 The restaurant’s stuffed lotus root with special fish paste served with stir fried spinach is a must! Crunchy and sweet, yet with a lovely fish paste stuffing, this dish is guaranteed to impress with its fine presentation as well. Seabass is not my favorite fish, but at New Formosa, even this dish tasted awesome. The flesh of the sea bass was cooked just right (I hate rough and overcooked fish) and the salted vegetables, sour plums, julienned ginger & chillies gave it a nice kick. Totally hit the sour, salty and sweet spot, if you know what I mean. So, if those dishes don’t impress you yet, you can always order from the ala carte menu. 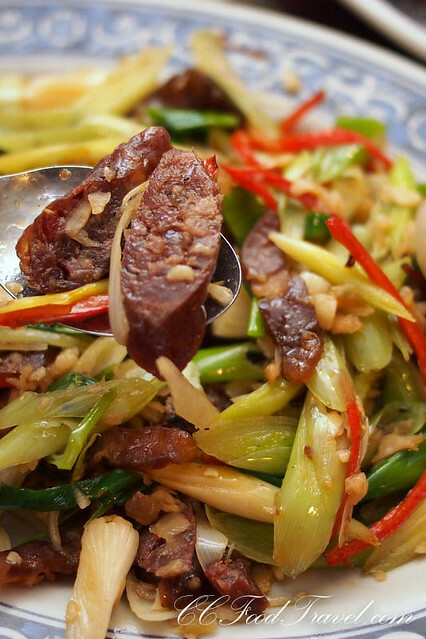 Fans of offal and blood sausages will love this dish of fried leeks & liver sausages. Insanely rich and fatty, the sausages are tempered perfectly by the crunchy leeks. A must order! And to cleanse the palate after that, be sure to have the pickled bitter-gourd and lotus root with wood fungus. It had tiny bits of choi-poh and even chillies in it. 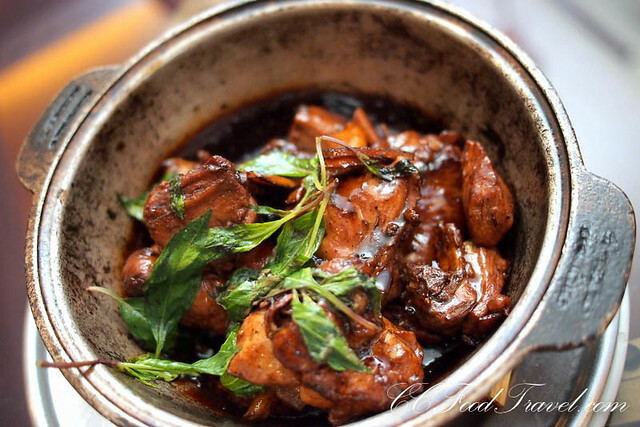 This tangy, sour, spicy dish will cut the grease in a jiffy, and make you feel like you want to eat some more! 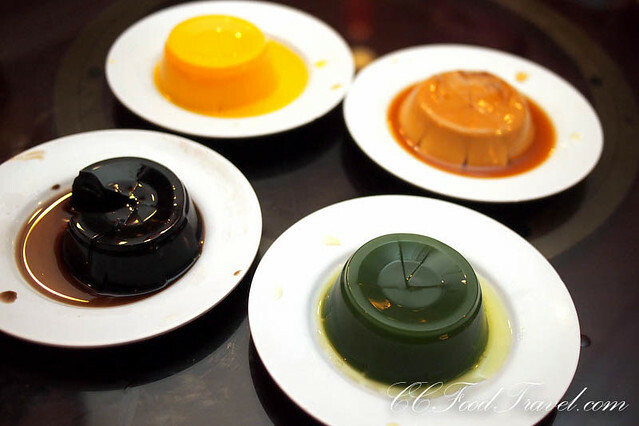 When it came to dessert, we were all gutted that they ran out of Or-Nhee, that classic Taiwanese dessert. However, we didn’t really complain when they sent some interesting jellies our way. 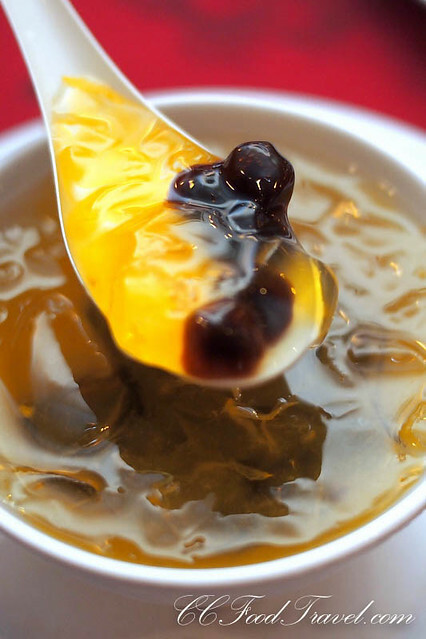 Finally dinner ended on a sweet note with some Taiwanese Lemon Aiyu Jelly served with black sago pearls. New Formosa’s seven-course set menu is priced at RM295 nett for 5 pax, RM548 nett for 8 pax, and RM588 nett for 10 pax. This set menus are available only till January 29, 2014. Well folks who eat pork ribs and pork knuckle and roasted pork.. Same difference! Where do they think the meat comes from? Of course there was a pig in there somewhere.. oh and a pig head! I guess ignorance is bliss for many. it’s been a long time since i last went to new formosa. the food still look so good! It is .. and this year has a lot of new and exciting dishes. So delicious! What a great presentation of the Hakka prawns. I agree.. and the food at New Formosa is absolutely fab! I agree. A pig is a pig. Unless you don’t eat meat, that’s a different story. My family had dinner here almost 5 years ago – love the food at New Formosa – wish they cooked like this in the states! Keep up the good blog ciki! OH you love that too huh? Yeah, well can always return for the Or Nee since we live close by. Another good excuse to return to New Formosa! My mother is big fan of Jeenie cooking! We want to try fried leeks & liver sausages next. How long is it on for this menu? Hi Adrian. Yes we are also fans of Jeanie’s great cooking.. who isn’t? Anyone who knows her, loves her and her dedication to the business. These set menus are on till January 29, 2014. Those on the ala carte menu should be on indefinitely. You may call up to ask. Thanks! Argh….always wanna try this out! I like their stuffed whole chicken! yes they do.. and they have a really good Yee Sang too. You can call the restaurant up for the different prices. THanks! Been a little curious about this place for a while. Shall tell my family to check it out next time I’m in SS2. I love 3 cup chicken!